TFTSP provides a perfect combination of a fascinating journey through the full history of financial market information, interwoven with Jessop’s personal experiences during his distinguished, yet very colourful career. The book is filled with amusing stories, frequently self-deprecating in nature, and I challenge anyone to find a more engaging, eloquently written and entertaining read. A thoroughly enjoyable AND informative book – highly recommended!! I have worked in the news and market data business for over 20 years, and I must admit I didn’t really know the half of it. Jessop takes his deep knowledge of the business, adds some extremely well-researched background, throws in humour and gossip and the result is a thoroughly entertaining book. At the same time I really learned something by reading it. Jessop’s self-deprecating tale of his own part in the business is fabulous. He is a well-known figure in the City and on Wall Street, better known for the cigar clenched in his teeth and his well-aimed insults. But his facade hides the fact that he was instrumental in taking the real-time market data industry from something the ‘news men’ ignored to front and center of the financial services industry. Anyone who has worked for Reuters, Telerate, Dow Jones, AP, Bloomberg etc. will be thumbing the pages looking for their names. And hoping that what they see is flattering! A part history, part autobiography told in a narrative and somewhat differing voice of bemusement, humour and joviality, the author’s distinct tone tells of the factual side, peppered with anecdotal stories of the work ethics in newsrooms such as Reuters, the author makes this book one to digest at your leisure. You’ll try to read it in one fell swoop but the author’s eye for details and the information given have to be taken a few chapters at a time. From the beginnings of Reuters to the the invention of a device for stockbrokers in the Sixties to facilitate their access of stock information, the author’s eye for detail, gives us a clearer picture of what it was like working for a financial news agency when the emergence of innovative systems were taking shape, like the Quotron System 7 in the Sixties and the Tafex, known as the “black box” in trading, in the mid Seventies. One amusing observation was that of equating the top `ruling’ team at Reuters to that of the Soviet Union’s ruling triumvirate in the Fifties which made me think of the rigidity of a system not following the times. It is a book I’d want to read when I can really sit down and imbibe the data, anecdotes – amusing and lighthearted at times and historical facts at my own pace. John Jessop demonstrate a side that we could easily see as conversant yet informative, jovial yet factual and the mixture of facts and part autobiography makes this book one you’d try to read from start to finish without putting the book down but there’s a lot of information in there that will keep you bemused for a long while. TFSP is very well written, enjoyable, well structured, not repetitive, and extremely readable. The interleaved history of Reuters and Telerate with the author’s personal story worked very well. The history must have taken a huge amount of research, and John really was there when it was all happening. I have recommended the book to innumerable people associated with the market data industry. I congratulate John Jessop, because it is a major achievement to have produced something of this quality. Jessop’s book is a major accomplishment, far surpassing a rough-and-tumble (tawdry) career that made him rich and famous-infamous. This may be the best book ever about Reuters and the battling Information companies and written ironically by a guy who didn’t do much writing as a journalist as far as I can remember as an ex-colleague. Jessop has embarrassed his predecessors. Nobody should dare write another book soon about Reuters. Don’t laugh, the writing style reminded me of Anthony Burgess “You’ve Had Your Time” and Malcolm Muggeridge “Chronicles of Wasted Time.” Minor annoyances were a few trivial, trite, suspect, slightly parochial and long-winded paragraphs, and my interest dipped when subjects strayed too far from Reuters. But enjoyed the harsh, irreverent, perceptive and presumably not unfair peoples descriptions and personality dissections. Fearless. I would have appreciated more human touches like this just to balance the heavy corporate stuff. Jessop is entitled to a well-deserved bow even if the book eludes any possible best seller instincts. John Jessop has written an interesting and at times very witty account of the financial news and data business. He brings an insider’s eye to the story having been involved in the industry for 40 years plus. Many will find it hard to believe how primitive and seat of the pants the business was back at the start of electronic news in the 1960’s – but Jessop guides through the major developments, the colourful characters and the business wheeler dealing that helped make the business a global behemoth these days. Buy this book – you will learn a lot about the financial news business and be entertained on the way. 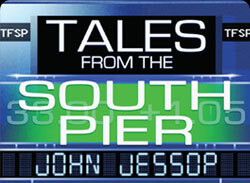 Tales from the South Pier is Right On! There is a very good reason why the author was a successful journalist at Reuters… he writes very well and does careful research! Additionally, he had the advantage of being there as a participant or observer when many of these events took place. His observations of personalities are often humorous but also right on the mark. Many of these so called “Leaders of Industry” were disfunctional as managers and leaders. I personally followed Mr. Jessop’s career for over thirty years and complement him for authoring a true, candid, and funny autobiography/history! There have been several books written about the evolution of the financial information industry, but this one is far and away the best. It starts in 1959 with the author employed as a clerk and tea-boy in Reuters’ London market reporting operation, and ends at the present day. In between John Jessop worked with most of the key organisations and people who made a $25bn a year industry out of a rag-bag of teleprinter services and newsletters. His first-hand knowledge is vast and for depth of analysis, colour and sheer readability this book will be hard to beat. More than that, the book evokes the vanished world of Fleet Street when it was the centre of news gathering for the English-speaking world, and the the excesses of the NY financial markets of the ’80s. It is a tale eccentricity, intrigue and a certain louche romance. Excellent. This book is well written, comprehensive, factual,amusing and altogether enjoyable and easy reading. Having been close to many of the events described by the author, I can attest to its authenticity. In my opinion, even if the reader has had no direct involvement in the financial markets, it makes fascinating and fun reading. Lots of amusing anecdotes, as well as serious, but not boring accounts of the origin and development of financial information dissemination technology. Buy the book and enjoy.. you won’t regret it.